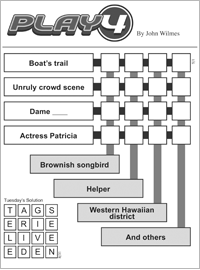 Categories: Crossword, Word, Family, For Kids, Men, Women, Puzzles, Top Games, Print, Mobile, Html5. Don't have lots of time? Try this quick, challenging four-by-four puzzle. It's perfect for a quick break — not too tough that you can't finish it in just a few minutes, but hard enough to keep you on your toes and coming back for more every day! John Wilmesâ€™ full-time job is in electrical industrial sales and marketing. He lives in St. Louis with his wife and their two sons. Wilmes is also active in such sports as tennis, softball, soccer and golf. He has always been interested in cryptograms and riddle-solving, but was frustrated by the time constraints his busy lifestyle put on crosswords. So he began to make PlayFour! word games for family & friends. What once was just his hobby has become a popular puzzle. Meet the Cast of PlayFour!